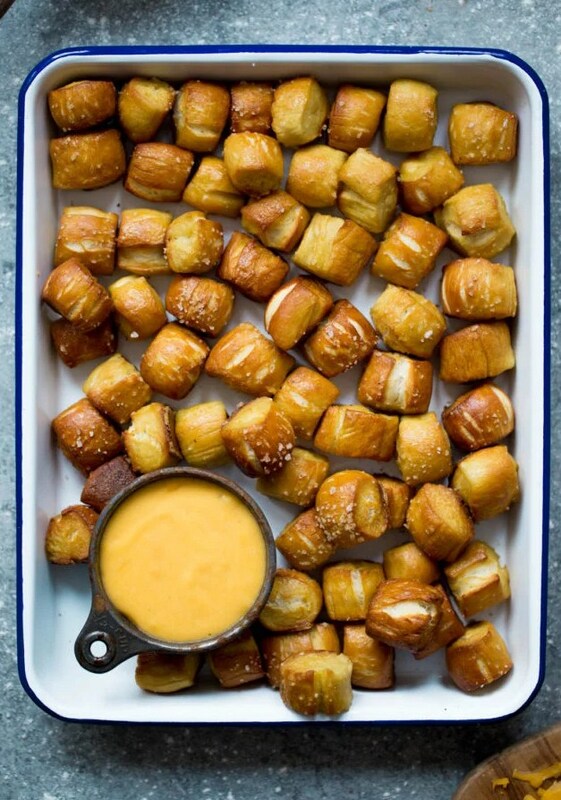 Pretzel bites are fun to make and fun to eat! For the Pretzels: Combine the 1 1/2 cups water, sugar, yeast, and butter in the bowl of a stand mixer and mix with the dough hook until combined. Let sit for 5 minutes. Bring the 3 quarts of water to a boil in a small roasting pan over high heat and carefully add the baking soda. It will boil over, so add slowly and be careful! Remove to a baking rack and let rest 5 minutes before eating. Serve with cheese sauce. Recipe makes a lot of bites-perfect for sharing!